Want To Experience the Continental Divide Trail? Since I plan on hiking the Continental Divide Trail in 2013, I wanted to find a way to introduce this jewel of a trail to all of my readers. Outside of the hiking community, few know about the CDT. I mentioned it in my UNPLUGGED post where you can see a general summary and map of the CDT. Few hike the entire CDT each year (~30) and even fewer journal about it. This year, we have the great privilege of being able to hike vicariously through the articles and pictures of Shroomer. 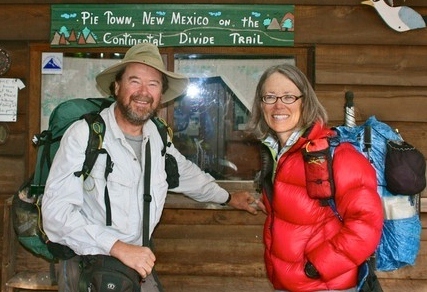 An experienced writer and hiker (PCT 2010). He and his hiking partner, Why Not(PCT 2009), are each keeping daily journals on Postholer, but it is Shroomer’s weekly articles and pictures that have me misty eyed and yearning to get out on the trail. Through his journal, I can see why many say that the Continental Divide Trail is their favorite trail. Shroomer’s writing goes to the heart of what thru hiking is all about. He humbly describes the beauty and magic of the trail while not dwelling on the expected discomforts of thru hiking. He takes note of the small things that change everything while still focusing on the big picture. I am most appreciative of the way he embraces and learns from the few people he meets along the trial. Many of whom are trail angels that make the Continental Divide Trail possible. He takes the time to really understand each and every person and the life they have lived. He goes to great length to describe the life and history of the people(many over 70yrs old) and places along the CDT. In doing this, Shroomer gives depth to the trail and honors its’ roots, heritage, and history. He isn’t just walking from Mexico to Canada. He is seeing it through open eyes and an even more open heart. Check out his articles and pictures and you’ll see why I’m so excited to attempt the Continental Divide Trail next year. How does one plan for food while hiking the Continental Divide. Mostly in Montana, Idaho, and Colorado.